Configure the log4j property group to control logging activities for each service running in your Hadoop cluster. Ambari uses sets of properties called log4j properties to control logging activities for each service running in your Hadoop cluster. Initially, default values for each property reside in Advanced[SERVICE_NAME]-log4j in a [SERVICE_NAME]-log4j template file, and in custom[SERVICE_NAME]-log4j in a custom[SERVICE_NAME]-log4j properties file. 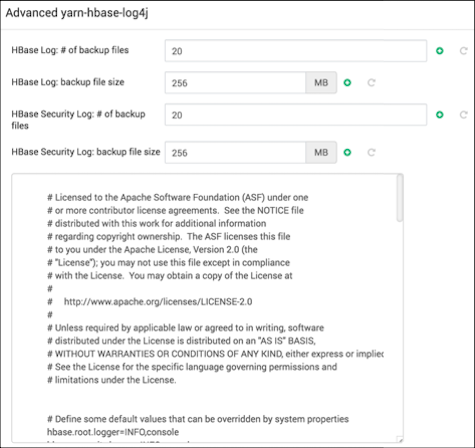 Log4j properties and values that limit the size and number of backup log files for each service appear in Advanced[SERVICE_NAME]-log4j with the log4j template file. Together, the log4j template, custom properties file and backup properties are called the log4j property group. To configure log settings for a service, first access the log4j property group for the service. In Ambari Web, browse to Services > [SERVICE_NAME] > Configs > Advanced[SERVICE_NAME]-log4j. In Ambari Web, browse to Services > [SERVICE_NAME] > Configs > custom[SERVICE_NAME]-log4j and browse to custom [SERVICE_NAME]log4j properties. Use the template and custom properties files for a selected service to edit and customize specific properties and values that control log activities for that service, as necessary. Edit properties in the log4j property group for a service to limit backup log files. Edit the log4j property template in which default log4j properties reside, and use those customizations to overwrite the custom log4j properties for each service to control logging activities for that service.